These microhistories — all in and of the Bay, give or take — enumerate the local and the particular. They plumb the archive for the body and the body for the archive, unearthing tensions between the collected and recollected, included and excluded, participant and fugitive. They seek to celebrate, to complicate, to reconfigure. The narrator is unreliable, the spectator is emancipated, and the facts only side-eye the truth. 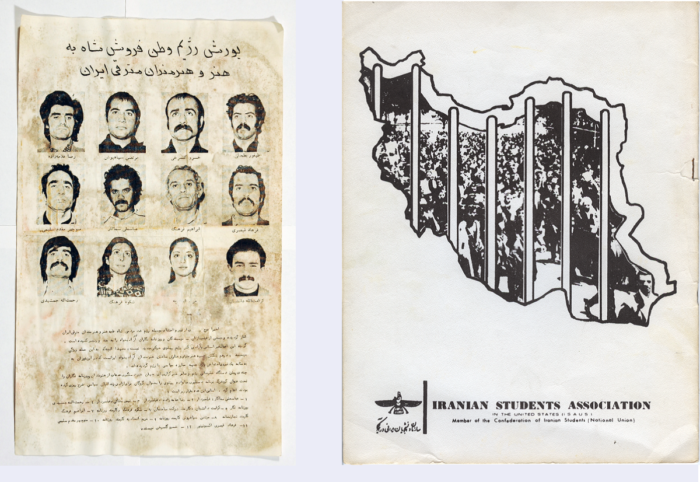 Archives belonging to the library of the Berkeley-based Iranian Students Association of Northern California (ISANC) reflect Iranian and Bay Area histories during the critical years between the CIA coup in Iran on 19 August 1953 and the aftermath of the 1979 Iranian Revolution. ISANC began its activities in 1964 as a member of the Iranian Students Association in the United States (ISAUS), which had joined forces with the Confederation of Iranian Students Association (CIS) in Europe in 1962; the resulting CISNU (National Union), an international, non-governmental, and politically autonomous organization consisted of various Iranian opposition groups sympathetic to the struggle for democracy in Iran. Immersed in the political climate of its era, influenced by the global liberation movements of its time, and directly involved with the many national and local freedom struggles in the Bay Area, the ISANC demonstrated solidarity with the Student for Democratic Society (SDS), the Black Panther Party, the Palestinian Liberation popular Front (PLFP), the Revolutionary Community Party (RCP), the Progressive Labor Party (PLP), as well as the Filipino, Ethiopian, and Arab student associations. 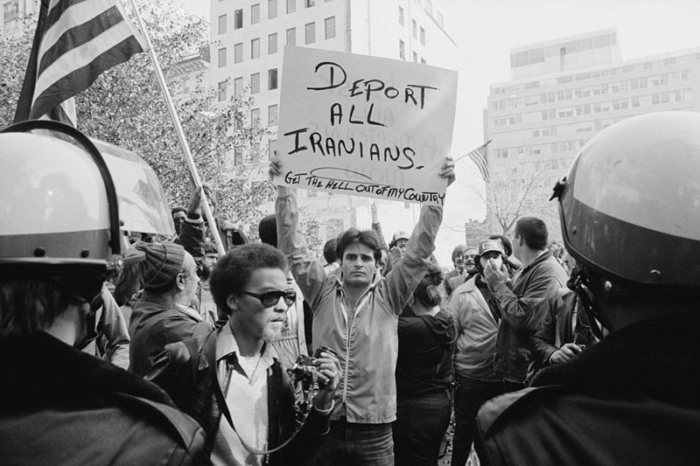 The organization came to a halt following the Iranian Revolution and the systematic arrests and executions of many ISA members who had returned to Iran to participate in the uprisings. 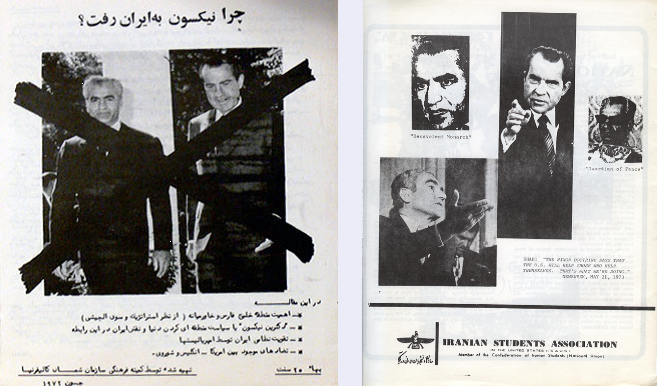 In 1982, ISANC closed its Berkeley-based “House of Iran” and discontinued its many publications. Below is a timeline documenting the history of ISANC against a backdrop of global conflicts and struggles. ­1941 •August Allied powers, including the US, Britain, and the Soviet Union, invade and occupy Iran. •The Allies force Reza Shah to abdicate in favor of his son. •October Tudeh Party of Iran is established. 1942 •Central Union of Worker’s Council is established; dominated by the Tudeh Party. 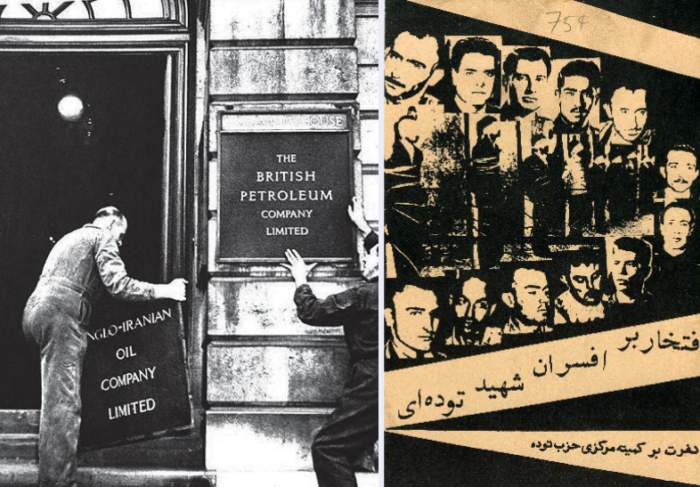 1944 •August 8 The Anglo-American Petroleum Agreement is signed, dividing Middle Eastern oil between the US and Britain. 1945 •April 12 Harry Truman becomes US President. •May Day Several thousand Anglo-Iranian Oil Company (AIOC) employees demonstrate for better housing, benefits, and higher wages. •Partial accommodations and additional payments are recommended by the British government. •People demand revising AIOC concession terms. 1946 •Major strikes cripple AIOC operations. •July Tudeh Party leads national strike of oil workers. 1947 •Dr. Mohammad Mosadeq is re-elected to the Majles (Parliament). •AIOC reports £40 million in profits; Iran gets £7 million. •Very bad working conditions for AIOC oil workers are reported by Iran’s Petroleum Institute. 1948 •June Several days of violent protests in Tehran and Qom, organized by Mullah Kashani. •First large-scale split of the Tudeh Party. 1949 •May Britain offers a “Supplemental Oil Agreement” to appease unrest in the country. •February 4 An attempt is made on Shah’s life by the Fadaaian e Islam; the Tudeh party is suspect. •The Tudeh party is officially outlawed. Leaders are arrested and jailed. •Constituent Assembly convenes and grants Shah power to dissolve Majles. •Jebha-ye Melli (National Front) is established, founded by Mohammad Mosadeq. 1950 •Abadan is the world’s largest refinery. •AIOC controls all oil in Iran. •National Front Party makes gains in Majles elections. •December American-owned Arabian American Oil Company agrees to share profits with Saudis on a 50-50 basis. •The UK Foreign Office rejects the idea of a similar agreement for AIOC. 1951 •National Front demands nationalization of AIOC’s assets. •Ayatollah Kashani organizes a movement against AIOC. •March 20 Oil Nationalization Law passes. •April 28 Mosadeq is appointed prime minister. •May Mosadeq enacts the Oil Bill. •Britain appeals to UN Security Council. •UN Security Council refers case to International Court of Justice at The Hague, which rules for Iran. •July Truman’s representatives arrive in Tehran to manage Anglo-Iranian oil dispute. •Mosadeq refuses the US’s offers. •July Mosadeq breaks off negotiations with AIOC. •AIOC threatens to pull its employees out of Iran. •Abadan refinery closes. •AIOC withdraws from Iran and increases output of its other reserves in the Persian Gulf. •Under British pressure, foreign countries agree not to purchase Iranian oil. 1952 •January 7 Mohammad Mosadeq is Time Magazine’s Man of the Year. •Production of oil plummets in Iran, while the country goes through financial turmoil. •Mosadeq visits President Truman pleading for help. 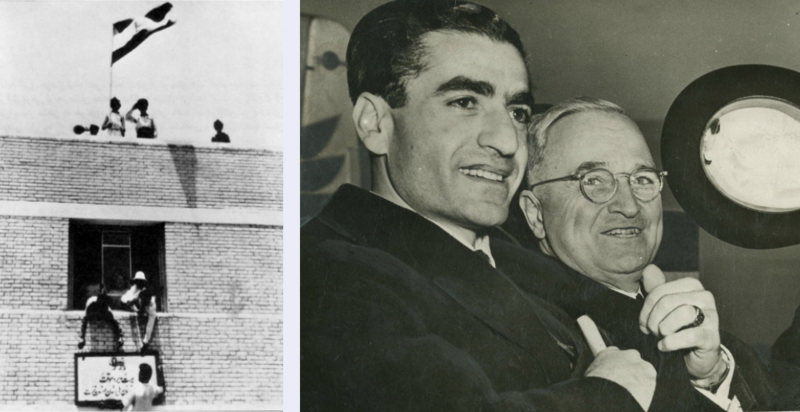 Truman tries to arrange a compromise between Iran and the British. •Winston Churchill strongly encourages a coup, but fails to persuade President Truman. •July 17 Conflicts between the Shah and Mosadeq leads him to resign. •Shah names Ahmad Qavam prime minister. •30 Tir Uprising Widespread protests against the Shah with the call for protests by the National Front, along with Islamists, nationalists, socialists. •Over 250 demonstrators are killed. The military orders the troops back to the barracks. •July 22 Mosadeq is reinstated. •Iranian authorities discover British plot to overthrow the government. All participants are arrested except senator Fazlollah Zahedi who has immunity. •Mosadeq breaks off diplomatic relations with Britain. 1953 •Iranian Student Association (US) is officially established as a pro-Shah organization. •Ayatollah Kashani severs relationship with Mosadeq. •Winston Churchill wins the support for US covert operation, convincing newly elected President Eisenhower that Mosadeq would become a threat in the new Cold War. •July 29 CIA plants stories in major American newspapers, weakening the Mosadeq government. •August CIA-MI5 initiate coup of Iran’s Imperial Court under codenames “operation Ajax” (CIA) and Operations BOOT (SIS (M16)). •August 4 Mosadeq suspects that American and British governments are plotting and calls for a referendum, dismissing Majles. 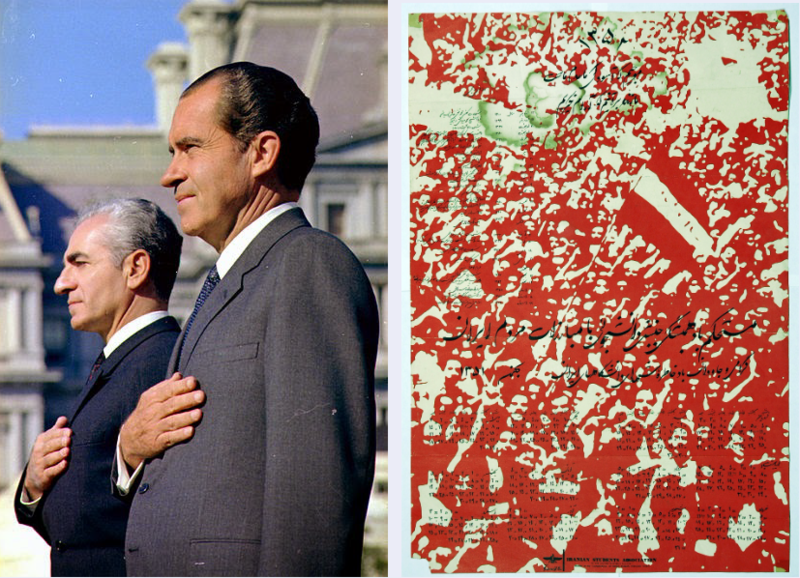 •August 13 Shah issues an edict dictated by Donald Wilber, the CIA architect of the plan that calls for removing Mosadeq from power, replacing him with the CIA-backed Fazlolah Zahedi. •August 17 Shah and Queen fly to Baghdad. •August 18 Statue of Shah is torn down in Tehran. •August 19 Street thugs are bribed by CIA and SIS to create an organized riot against Mosadeq. •Pro-Mosadeq Chief of Police is killed. •Tanks are led to Mosadeq’s residence. Mosadeq is arrested. •August 21 Shah and his queen return from Rome. •November Nationalists organize mass demonstrations. •The Tudeh Party participates in the demonstrations. •December 7 Vice President Nixon visits Iran. •University students demonstrate against Nixon’s visit. •December 7 Student Day Soldiers kill three students at the University of Tehran. •Active political student organizations in Iran are crushed. •Mohammad Mosadeq is tried by a military tribunal. •December 21 Mosadeq is sentenced to death. •Mosadeq’s sentence is reduced to three years, and life under house arrest. •Many more members of National Front are tried, imprisoned, and tortured. •October 29 Deputy Prime Minister Hossein Fatemi is executed by the order of the Shah’s military court. 1954 •Iran and Western oil companies reach agreement. •AIOC becomes British Petroleum Company (BP). •Iranian oil industry resumes operation. •Tudeh Party cell is discovered in the military. •Several officers of the Tudeh Party are tried and executed. 1955 •Tudeh Party executions continue until last of officers are executed. 1956 •Seyed Mojtaba Navab Safavi, founder of Fadaiian-e Eslam, and his lieutenants are captured and executed. 1957 •SAVAK, Iranian secret police, is formed with advice from US and Israeli MOSSAD. •March 5 US and Iran sign nuclear agreement as part of President Eisenhower’s Atoms for Peace program. •National Resistance Movement of Iran is founded by Ayatollah Mahmud Taleqani, a supporter of Mosadeq’s oil reforms. 1958 •Tudeh Party leaders are executed for failed assassination attempt against Shah. 1959 •Iran and the US sign bilateral defense agreement. 1960 •April Confederation of Iranian Students (CIS) is established in Europe. 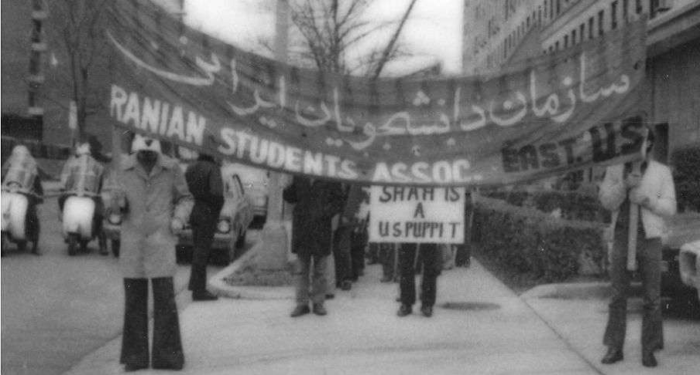 •US based Iranian Student Association elects anti-Shah leadership, transforming itself from a pro-government organization into a voice of the opposition. •May 13 Several hundred Berkeley students clash with the police when protesting the hearings of the House Un-American Activities Committee (HUAC) in San Francisco. •Students for a Democratic Society (SDS) is founded. •Organization of Petroleum Exporting Countries (OPEC) is launched. •Criticism of Shah’s regime leads to a series of reforms in Iran. 1962 •The ISA and CIS unite to form the Confederation of Iranian Students (National Union), or CISNU, endorsed by the Organization of Tehran University Students. •October 1 The first black student registers at the University of Mississippi, escorted by Federal Marshals. Riots break out; two people are killed and at least seventy-five injured. 1963 •Shah’s six programs of White Revolution reforms are approved. •February 11 The CIA’s Domestic Operations Division is created. •Ayatollah Khomeini launches a campaign against Shah’s reforms. 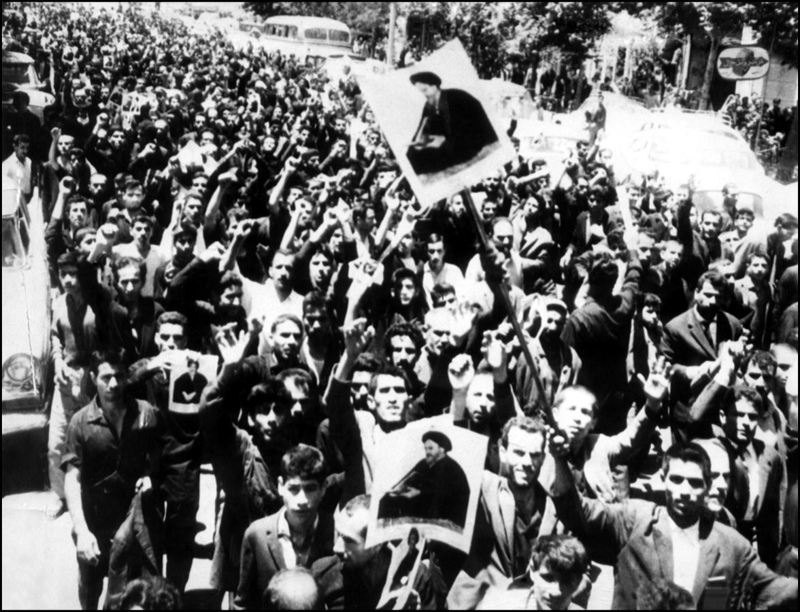 •June 5–6 15 Khordad uprising 100,000 anti-government protests are suppressed. 20 die. •Khomeini is imprisoned. 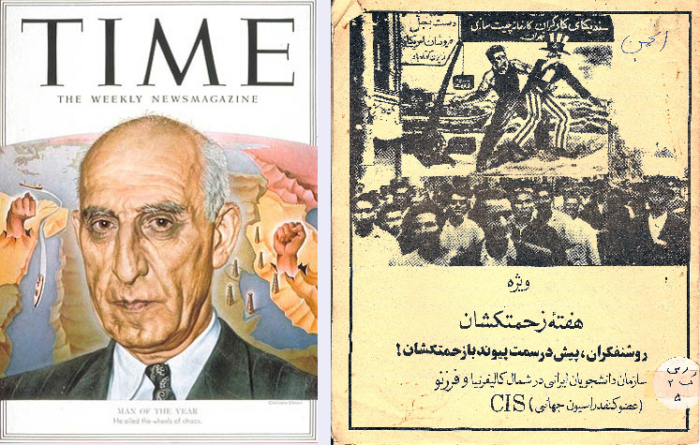 •ISA members in Washington, D.C. organize an overnight march from Baltimore to the White House to protest repression of the 15 Khordad uprising. •August 28 American civil rights activist Martin Luther King Jr. delivers a public speech in which he calls for an end to racism. •CIS shifts to a more radical line, following the opposition at home, inspired by Third World anti-colonial revolts, and influenced by the radicalization of student movements in Europe and the US. •A new generation of Marxist and Islamic activists work underground to mount a guerilla campaign in Iran. •A number of members of the opposition abroad, including Confederation activists, approach Cuba, Algeria, China, and Palestinian guerrilla organizations for support. •October 1963–September 1964 Students from UC Berkeley and San Francisco State University, including Iranian students, participate in picketing of the Sheraton Palace Hotel in San Francisco in protest of racially discriminatory hiring practices. Over 170 demonstrators are arrested. •November 22 President Kennedy is assassinated in Dallas. 1964 •Martin Luther King Jr., a leading civil rights activist, wins the 1964 Nobel Peace Prize. •Newly elected US president Lyndon Johnson declares war on poverty. •US Congress passes many reforms including Medicare, Medicaid, and the Voting Rights Act. •March 26 Secretary of Defense Robert McNamara publicly and forcefully rejects “withdrawal,” “neutralization,” or “peace at any price” in the war Vietnam. •May 2 First major student demonstrations against the Vietnam in NYC, San Francisco, and other major cities in the US. •The Shah’s US summer tour is marred by ISA protests, making national news. •Iranian students and allies disrupt graduation ceremonies at NYU. •September–December Free Speech Movement, UC Berkeley. •UC Berkeley student activists come into conflict with university administration over the right to use university facilities for political advocacy. •Under the informal leadership of student Mario Savio, the Free Speech Movement arises out of debates, protests, sit-ins during this time. •Khomeini is forcibly exiled to Najaf, Iraq. 1965 •January 18 Malcolm X denounces US involvement in Vietnam. •February 21 Malcolm X is assassinated. •March 9 President Johnson authorizes the use of napalm. •April US military invades Dominican Republic. •Black Panther Party is founded in Oakland, CA. •Islamist students split from CISNU. •The Revolutionary Organization joins CISNU’s elected leadership alongside the National Front. Maoism influences both parties and CISNU. •CISNU declares the Shah’s government illegitimate in their 4th annual congress. Other CISNU resolutions condemn Khomeini’s exile, Soviet support for the Shah, and US intervention in Vietnam and the Dominican Republic. •August 12 Protests breaks out the predominantly African American neighborhood of Watts, Los Angeles. •Watts demonstrations result in 34 people are killed, 1,100 people are injured, 4,000 people are arrested, and an estimated $100 million in damage is caused. •October 15 Anti-Vietnam war rallies held in four US cities, the largest in New York and Berkeley. •CISNU establishes ties with Khomeini. •Bertrand Russell and Jean-Paul Sartre join CISNU-Amnesty International campaign against torture and advocate freeing political prisoners in Iran. •In New York, police make the first arrest under a new Federal draft card-burning law. •CISNU members’ hunger strikes push UN Secretary General to address Iranian authorities regarding fourteen political prisoners, four of whom face the death penalty. This publicity results in overturning the death sentences. •November 27 Over 20,000 anti-war demonstrators rally at the White House “March on Washington for Peace in Vietnam.” 1966 •More than half of Iran’s university students are abroad. •ISAUS grows rapidly along with influx of Iranian students in the US. •FBI surveillance of Iranian students in the US increases. •May 13 Ronald Reagan, candidate for California governor, demands a legislative investigation of alleged communism at UC Berkeley, blaming the political turmoil on “a small group of beatniks, radicals, and filthy speech advocates.” •June 19 The US Senate Internal Security Subcommittee charges that communists have played a key role in anti-war demonstrations. •Resolution passes calling for immediate US withdrawal from Vietnam at ISAUS’s annual congress in Los Angeles. •Members of Maoist-influenced parties dominate elected leadership. •CISNU recognizes it can no longer act as a National Union for Iranian Students and embraces its role as an opposition movement. •The Revolutionary Organization sends twenty-four people to Cuba for training. •Tudeh Party splits over Soviet disputes. Forms Marxist Leninist Organization of Tufan and a new party, Iranian People’s Mojahedin-e Khalgh. •October 10 The first of many university campus protests against the presence of recruiters for Dow Chemical who manufacture napalm takes place at UC Berkeley. 1967 •January 1 Martin Luther King, Jr. openly expresses support for the antiwar movement on moral grounds. •March 5 Mohammad Mosadeq dies. •ISAUS cancels its annual Nowruz celebrations to observe 40-day mourning period. •In San Francisco, 100,000 march against the war in Vietnam. •May 31 “Declaration of conscience” is signed by 600 faculty members at California colleges and universities, for “full and active support” to “all who determine that they will not participate in this war.” •Return of open student protest in Iran. •Marxist university students organize a demonstration against the regime. •Two students are killed by the regime in Tabriz and fifty to 100 are arrested or drafted into the army. •Tehran University remains closed for the remainder of the year. •June Shah visits West Berlin. •A German student dies in clashes between demonstrations against Shah’s visit and the police. •Confederation is radicalized. Internal tension grows. •Marxist grows within the Confederation. •More traditionalist Islamic activists withdraw from the confederation. •Maoist groups become more influential and challenge other groups for control of the Confederation during the Chinese Cultural Revolution. •August ISA members protest the Shah’s visit to CIA headquarters in Langley, VA. •August 22 ISA protesters clash with police in front of White House as Johnson receives Shah. •August 23 ISA Students break through police lines and attack the bullet-proof car taking the Shah to Congress. •October 21–22 Massive march on Washington, D.C to End the War in Vietnam, a loose coalition of 150 activist groups. •October 26 Shah’s Imperial (self) Coronation. •October 25–26 ISA organizes militant protests against Shah’s self coronation as “king of kings.” •October 21 In San Francisco, at a demonstration in front of Iranian Consulate, SF police try to arrest ISA leader Khosrow Kalantari but protesters drag him away successfully. 1968 •January At its 7th congress in Frankfurt, Germany, CISNU declares itself anti-imperialist and offers unconditional support to the Vietnamese National Liberation Front (NLF). •CISNU campaigns to save the lives of revolutionary intellectuals in Iran, including Bijan Jazani and Hassan Zia-Zariffi. •International pressure forces Iranian government to grant them an open trial and prevents them from receiving the death penalty. •April 4 Memphis, Tennessee Martin Luther King is assassinated. •Urban uprisings break out in Washington D.C., Boston, and more than a hundred other major cities. •In Chicago, nine African Americans are killed after more than 10,000 police and 5,000 army troops are deployed and twenty blocks are burned. •May In France, “Bloody Monday” marks one of the most violent days of the Parisian student revolt. •April 11 Congress enacts the Civil Rights Act of 1968. •June ISAUS protests at Harvard as Shah receives honorary degree. •June 5 Senator Robert Kennedy is assassinated in Los Angeles moments after declaring victory in the California Democratic presidential primary. •In Mexico hundreds are killed or injured in a clash between student demonstrators and military troops. •CISNU sends representatives to Najaf to meet with Khomeini. •October 31 President Johnson announces a total halt to US bombing in North Vietnam. 1969 •February 4 The Third World Liberation Front and police clash on UC Berkeley campus; 20 students are arrested and 10 injured. •February 5 CA Governor Ronald Reagan declares “a state of extreme emergency” on the UC Berkeley campus. He authorizes California Highway Patrol and Alameda County Sheriff’s Office to maintain order. •Anti-war demonstrations are staged in various parts of the country. •250,000 march in New York. •At the San Francisco Presidio, demonstrators scuffle with military police. •May 19 One hundred UC Berkeley faculty members hold a vigil to protest police and National Guard violence during the People’s Park confrontations. •May 21 Faculty at UC Berkeley begin official boycott of classes. 1970 •February 14–15 Four Chicago 7 defendants are sentenced to lengthy prison terms for contempt of court. •Berkeley crowds protest sentences given to Chicago 7 attorneys. They march to the University, breaking the windows of sixty businesses along the way. Fifteen are arrested and nine injured. •10th CISNU congress pledges material support to Vietnamese and Palestinians. •US provides military aid to Iran under “Nixon Doctrine.” •April 15 Moratorium Day against the Vietnam War Berkeley students attack the campus Navy ROTC building. The University declares a state of emergency. •Tehran University students engage in mass protest against bus fare hikes. •May 1 UC Berkeley students attend massive protests. •UC regents close the university for a four-day weekend. •May 4 National Guard troops fire on anti-war demonstration at Kent State, killing 4 students and wounds 10. •National student strike spreads. •May 15 National Guard fires on students protesting US war in South East Asia at Jackson State College in Mississippi, killing 2 students and wounding 11. •June 26 Forty-one Iranian students are arrested at ISAUS occupation of Iranian consulate in San Francisco. •June 28 A small “gay-in” in Golden Gate Park, the first event resembling the modern San Francisco Pride celebration. 1971 •January SAVAK releases the names of 236 students who involved in anti-shah activities abroad. •February 8 Siahkal Uprising Anti-Shah rebels clash with authorities in the Caspian Sea city of Siahkal. Many lose their lives. •Confederation is declared illegal, membership a prison offense. •A new draft constitution affirms the Confederation’s character as an open, democratic anti-imperialist organization independent of all political parties. •April 24 Massive anti-war rally of 200,000 is held on the Mall in Washington, D.C. •Over 156,000 participate in antiwar demonstrations In San Francisco. •May 24 Amir Parviz Pouyan, founder and theoretician of the Fadaiian-e Khalq is killed in a confrontation with SAVAK. •SAVAK attempts to cripple the Confederation through infiltration and exacerbation of internal conflicts. •October 12–25 Iran invites world dignitaries for a 2,500-year celebration of Iran’s monarchy. •CISNU protests the Shah’s extravagant celebration marking 2,500 years of Persian monarchy. Two hundred and fifty of the 1000 CIS members at UC Berkeley attend the demonstrations outside the Iranian Consulate in San Francisco. 1972 •July President Richard Nixon visits Iran. •Leftist guerilla groups and University of Tehran students carry out demonstrations during Nixon’s visit. 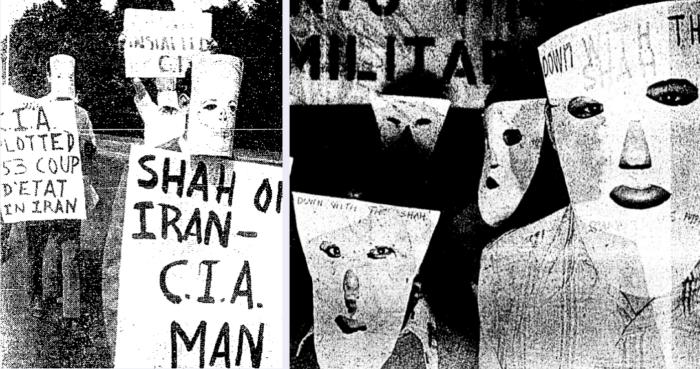 •CISNU organizes protests Nixon’s visit in the US and Europe. 1973 •OPEC Oil Crisis Price of oil quadruples. •March FBI begins arresting ISA members in California using a list of names provided by the Iranian consulate. 1974 •January 15 At CISNU congress, proposal to openly call for overthrow of Shah meets with opposition arguing it is beyond the scope of student organization. •February 4 UC Berkeley student and publishing heiress Patricia Hearst is kidnapped by a self-proclaimed revolutionary group known as the Symbionese Liberation Front. •February Sixteen are arrested for a plot to kidnap the Shah and queen. •Daneshian and Golsorkhi’s military trial is broadcasted nationally. •February 18 Khosro Golesorkhi and Keramat Daneshian are executed. •March 8 CISNU activists occupy Iranian embassies in Brussels, the Hague, and Stockholm to protest the executions of Golesorkhi and Daneshian. •July 5 Shah visits France. 1975 •CISNU’s support for Iranian guerrilla groups splinters the organization. •CISNU 16th annual congress shows organization is still at a peak of influence. It approves a new charter calling explicitly for the overthrow of the Shah’s regime. •Guerrillas in Iran suffer major losses; almost all their original leaders and cadres are either killed or arrested by security forces. •Bijan Jazani, Marxist theoretician, is murdered in Evin prison. •May 15 Gerald Ford opens US nuclear technologies to Iran. •Several US Congressmen publish letters of protest against political imprisonment and executions in Iran. Citing media evidence of Iranian government repression, legislation is introduced to strengthen Congressional control of arms sales to Iran. •Many members of ISA go on hunger strike in solidarity with political prisoners in Iran. 1976 •Jimmy Carter is elected President of the United States. •Number of Iranian students in the US reaches 35,000. •Iran’s military expenditures triple, reaching $18.07 billion. •August 16 Iran’s human rights violations are criticized by Amnesty International, including treatment of political prisoners. •Confederation activists occupy Iranian consulate in Geneva and reveal SAVAK’s secret activities in European countries. •May Washington Post reports on torture and terror in Iran and SAVAK spying on Iranian students in the US. •Time Magazine names Chile and Iran the two worst countries for torture in the world. 1978 •Over 100,000 Iranian students in foreign countries, about half of them in the United States. •CIS members abroad work together in broad coalitions of independent groups. •January 9 Police open fire into a crowd in Qom protesting against the article. •April 26 Thatcher and Reagan visit Tehran. •July–August Serious urban protests in Mashad, Isfahan, and Shiraz. •Fadaiian-e Khalq bombs Iran-US Cultural Center. 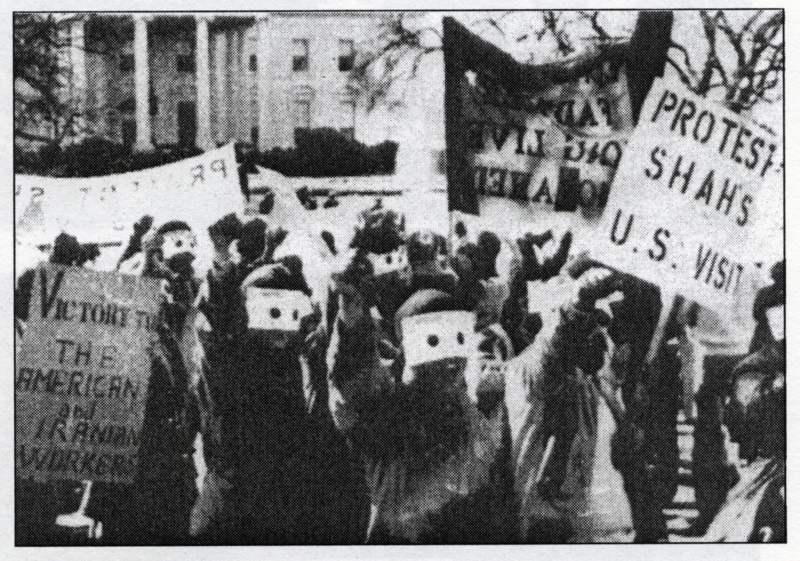 •CISNU protests the Shah’s visit to the US. •The Iranian government declares the Confederation is no longer illegal and assures the safety of returning members. •Many CISNU members return to Iran to participate in the Revolution. •Political prisoners in Iran go on hunger strike. •Demonstrations are held by students at Tehran University and Science and Industry University. •September 1 Outside LA Times offices, police clash with ISA demonstrators demanding media coverage of events in Iran. Thirty protestors are seriously injured and 171 are arrested. •September 4 Over 100,000 demonstrators march in Tehran, calling for the return of Ayatollah Khomeini. •Demonstrations in Tehran target banks, cinemas, and cabarets. •Shah declares martial law in Tehran and other cities. •September 8 Black Friday Troops open fire on demonstrators in Jaleh Square. Eighty-eight lose their lives. •Oil industry workers launch first major strike. •October 6 Khomeini is forced to leave Iraq for Paris. •November 5 British Embassy is attacked. •Khomeini’s tape-recorded messages are distributed widely around the country. •University students and newspapers join demonstrations. •Eighty-six political prisoners are released. •Nationwide demonstrations. •November 19 The government frees 210 political prisoners. •December 10–11 Massive demonstrations are mobilized in Tehran and across the country. •December 18 Oil and other industrial workers stage a general strike in response to a call by Ayatollah Khomeini and the National Front. •Oil workers’ demonstrations shut down industry. 1979 •January 1–2 Demonstrations and unrest continue throughout the country in opposition to newly appointed Prime Minister Bakhtiar’s government. •January 2 Two thousand Iranian students march through Beverly Hills to the home of Princess Shams. Local police, State Department, and Iranian security agents launch a coordinated attack, driving speeding cars into the demonstration and firing live ammunition. Forty-five students suffer serious injuries. •January 12 Council of The Islamic Revolution is founded. •February 1 Ayatollah Khomeini returns to Tehran. Over three million greet his return. •February 11 Iranian Revolution •February 18 Islamic Republic Party is launched. •March 8 Celebrations for International Women’s Day turn into protests with over 30,000 denouncing Khomeini’s new laws against women. •May US Senate denounces summary executions in Iran. •August All leftist opposition groups are crushed by the Islamic forces. •August Mojahedin-e Khalgh are forced to go underground. •August 20 Ayatollah Khomeini orders the closing of twenty-two newspapers and magazines. •October Shah is allowed entry into the US for medical care, in spite of Iran’s objection. •CISNU organizes demonstrations in NY in front of the hospital where Shah is undergoing treatment. •November 4 1979–January 20 1982 Hostage Crisis •Iranian militant students storm the US embassy in Tehran, taking sixty-six American diplomats hostage. •Students demand return of Shah to Iran to face trial in exchange for release of hostages. •November Iranians release 13 hostages. •War with Iraq brews. 1980 •Ayatollah Khomeini is Time Magazine‘s Man of the Year. •January 4 US files complaint against Iran. •Iran and the United States sever diplomatic relations. •January 23 Carter Doctrine proclaims that US would use military force if necessary to defend its national interests in the Persian Gulf. •Carter’s Green Belt policy helps form an Islamic green belt around communist Russia to contain Soviet expansion. •April 24 US “Desert One” rescue attempt fails. Eight American commandos die in the mission. •July 27 Shah dies in Cairo. •September 22 Eight year Iran-Iraq war begins. 1981 •January 19 Iran and the US sign Algiers record. •January 21 Hostages are released after 444 days as Reagan assumes presidency. •June 18 Bahaii followers are executed. •Second wave of executions and Tudeh arrests. •The Tudeh Party is officially outlawed. •Last of the Communist organizations in Iran goes underground. 1988 •July 28–November Over 4,500 political prisoners across Iran are executed. Hamid Shokat, History of the Confederation of Iranian Students (National Union) (Los Angeles: Ketab Publishing, 1994; 2010). 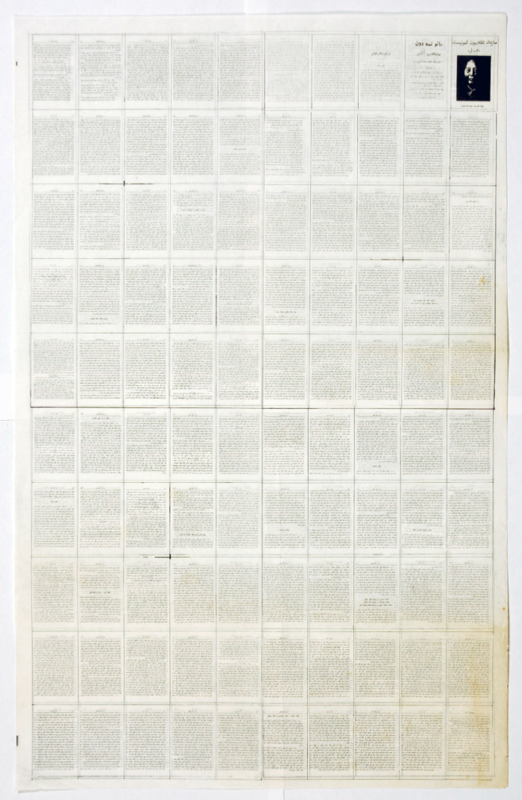 “Confederation of Iranian Students, National Union,” Encyclopaedia Iranica, http://www.iranicaonline.org/articles/confederation-of-iranian-students. Ervand Abrahamian, Iran Between Two Revolutions (Princeton: Princeton University Press, 1982). Afshin Matin-Asgari, Iranian Student Opposition to the Shah (Mazda Publishers, 2002). Maziar Behrooz, Rebels With A Cause: The Failure of the Iranian Left (London: I.B. Tauris Publishers, 1999). Mathhew K. Shannon, An Augury of Revolution: The Iranian Student Movement and American Foreign Policy, 1960-1972 (Department of History, University of North Carolina at Wilmington, 2009). The Theory of Survival Archives; Hoover Institution Library and Archives at Stanford University; the Bancroft Library at the University of California, Berkeley; and the Library of Congress. Sources for images include the National Security Archives, the NY CIA in Iran Report, Wide Asleep in America, and Fubar and Grill. 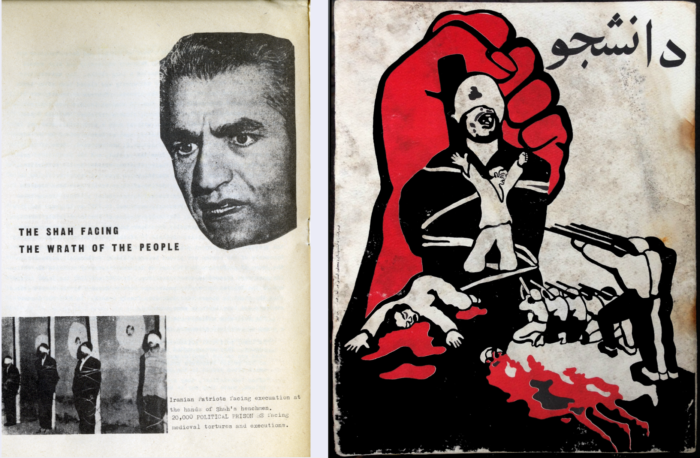 Theory of Survival projects invite artists, scholars and audiences to engage with archives of dissent of pre- and post-Iranian Revolution. Iranian Students Association of America, Defend the 41 (Berkeley: ISAUS, 1973); ISAUS, Iran’s Kent State and Baton Rouge (Berkeley: ISAUS, 1973).